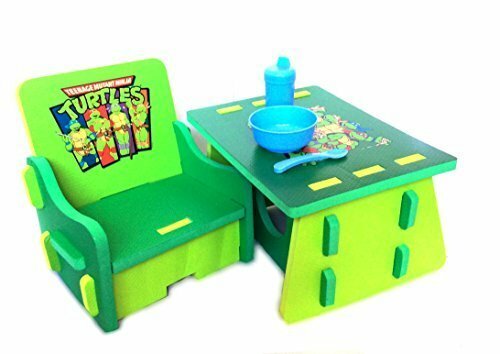 This Nickelodeon's Teenage Mutant Ninja Turtle foam Table and Chair is a perfect place to eat, color, play, or study for boys and girls. The table features Donatello, Michael Angelo, Rafael and Leonardo from the classic cartoon action heroes The Ninja Turtles. Makes a great gift idea for your very own baby boy. This toddler table chair set comes with a pull-out seat made of soft green foam. Made perfectly for your child size and weight. Don't worry Mom's and Dad's this table and chair can be easily wiped clean, easy to set up and come apart easily for storage with no tools required.